To spark discussion, the Walker invites local artists and critics to write overnight reviews of our performances. The ongoing Re:View series shares a diverse array of independent voices and opinions; it doesn’t reflect the views or opinions of the Walker or its curators. Today, filmmaker-writer Justin Schell shares his perspective on Friday’s performance of Tortoise and the Minneapolis Jazz All Stars. Agree or disagree? Feel free to share your thoughts in comments! 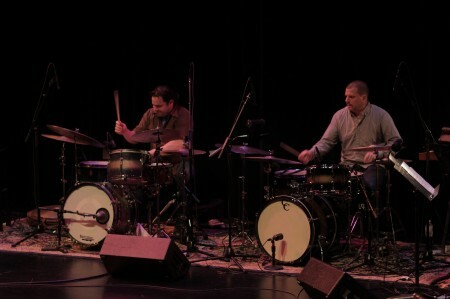 The Walker closed out the music at the McGuire portion of its performing arts season with a one-off, never-before-heard collaboration between Tortoise and five of Minneapolis’ best jazz musicians. In total, there were 10 people on stage, with the Minneapolis crew (multi-saxophonist Douglas Ewart, multi-horn player Grew Lewis, tenor saxophonist Michael Lewis, cellist Michelle Kinney, and drummer J.T. 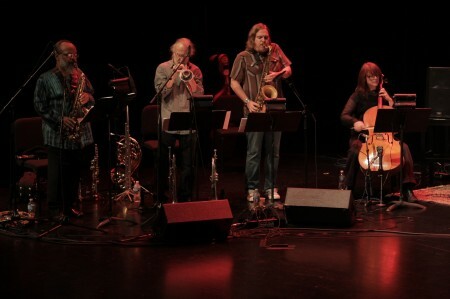 Bates) and Tortoise (Dan Bitney, John Herndon, Douglas McCombs, John McEntire, and Jeff Parker) on the right. The first song of the night, which built up incredibly slowly and almost unnoticeably in terms of activity and volume, had at its base a 10-note phrase that consisted of five notes played forwards and backwards. It was a nice formal “introduction,” and reflection, of the players on stage at the McGuire. The group proceeded from there to artfully segue between a number of songs without pause, with some of them featuring stop-on-a-dime transitions between breakneck tempos to slow, graceful, and flowing melodies. The first “set” of songs lasted about 50 minutes, which seemed to portend a really epic concert; however, the rest of the show only lasted another 30 minutes or so, with one encore. Despite this relatively short length (at least by Walker standards), there were not only plenty of examples of individual expert musicianship from both the 312 and the 612, but this assembled group expertly came together as just that: a group. No one seemed to be “following” each other in terms of hierarchy; if anything, Tortoise acted more like a traditional small jazz group rhythm section (though a helluva rhythm section they were), laying down grooves for the Minneapolis musicians to solo over. That being said, the musicians were playing Tortoise songs, but bringing their own interpretation to them, a mix of improvisation and composition or, better yet, improvisation within composition. The best thing about this type of collaborative music-making in a such a large group is the multiple levels of interaction that happen. On a macro level, you heard the full band riffing off of each other across the stage, melody lines or rhythmic patterns played throughout the band. Other times, it was just a handful of musicians, or even a pair. A great moment was when Douglas Ewart built a solo around the five-note rhythmic pattern that the Tortoise rhythm section laid down. Sometimes there were multiple interactions going on at the same time. The most fascinating interactions to watch, however, were between the two drummers, J.T. Bates and Johnny Herndon (sometimes known as Johnny Machine). At times, they were both laying down the same basic groove, but hocketing different accents on toms, cymbals, and snares as they both effortlessly ranged over the entire drum set. Other times, they used hands, brushes, sticks, timpani mallets, whatever to build percussives that functioned less as grooves, and more as sonic landscapes in their own right. I could’ve watched the two of them all night. For reasons beyond the obvious I can’t quite suss out yet, I couldn’t help thinking of Adam Yauch during the show. R.I.P. Adam. And you don’t stop.